Welcome to VPG Buildwell India Pvt. Ltd.
VPG Buildwell India Private Limited is a leading manufacturer and exporter of construction machines. 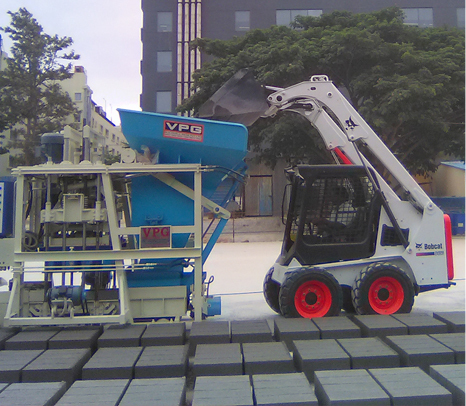 These machines are made with precision and attention to each and every detail keeping in mind the industrial requirements.VPG Buildwell India private limited are pioneers in the construction field and the largest manufacturers of concrete and block making machines in South India. Established in the year 1972 we VPG Buildwell India Private Limited manufacture, supply, trade, retail, distribute and export a wide array of optimum quality Construction Machines. Our product range comprises of Concrete Mixer Machines, Concrete Block Making Machines, Flyash Brick Making Machines, Concrete Batching plant & Material Handling equipments. These machines are precisely engineered using latest machinery that is based on cutting-edge technology to ensure optimum standards of quality. Offered machines can be customized as per the specifications provided by our esteemed customers. Manufactured in compliance with the industry laid standards, these machines are highly demanded in the construction and allied industries. Our founder Mr.A.S.Varadarajan B.E, M.E (Professor and HOD of Mechanical Engineering in PSG College of Technology) spent ample amount of time in research and design. With his prolific knowledge, he dedicated his life for the wellbeing of the country and as a result, lifted reputation of the company to great heights. Setting benchmarks in the industry, we export our products to various countries including the United States, Australia, Maldives, Sri Lanka, Africa, UAE, Saudiarabia & Tajikistan. By setting the highest standards, we have maintained an excellent rapport with all of our clients around the world. Starting as a small industry then, today, we have spread our wings as a reliable name across the globe with our team of trusted and dedicated members. Owing to the ultra-modern and sophisticated infrastructure facility comprising of built up area 52,000sq.ft and Open area 45,000sq.ft of our organization, we have been able to manufacture and supply a wide range of machines used in construction industries. Spread over a wide area of land, the infrastructure facility is divided into various divisions in a planned manner to ensure streamlined operations. Our infrastructure facility is upgraded regularly with latest machinery, to meet the ever-changing market trends in most efficient manner. To effectively handle our infrastructure unit, we have appointed a team of highly experienced and skilled engineers and technicians.